Do not allow heavy and uncomfortable cameras to not let you make great pictures or record a variety of videos in a moment! To do this, we have invented a special, completely new camera, which not only creates high-quality pictures, but also has excellent performance, and its weight is only 72g. Now, when you're going on a journey or to actively relax, there is no need to carry a noncompact, heavy device to stop in order to focus on something. You just press a button and you get a striking image quality with bright and vivid colors. A built-in camera WIFI adapter will help you at any time to synchronize all of the files on the phone and edit them in a moment. Optional accessories can help to create unique images. Take Yi Camera with you, enjoy and have a lot of fun from shooting. wide-angle lens (viewing angle of 155 degrees), clear and vivid picture. Now, there is no need to spend time focusing. Make precise, clear images at any time instantly. We chose aspheric optics HD, optical glass lenses custom-made by American team of experts, the viewing angle of 155 degrees. Thus, large images from a specific angle will be very expressive and will not leave you indifferent. We also connected Sony image sensor with lens for each picture to impress us with its naturalness. Do you want to make a good shot on the background of a landscape while traveling? You do not want template pictures? Specially for travelers there is a wonderful device for photographing - monopod for selfie, increase the distance from camera to yourself on 71cm. Doesnt matter if you want to take a picture of yourself or your entire company on the background of a beautiful landscape, now it can be done very easily. With WIFI or remote control via Bluetooth, you can take pictures with a variety of animals on the background of cliffs or tall buildings. 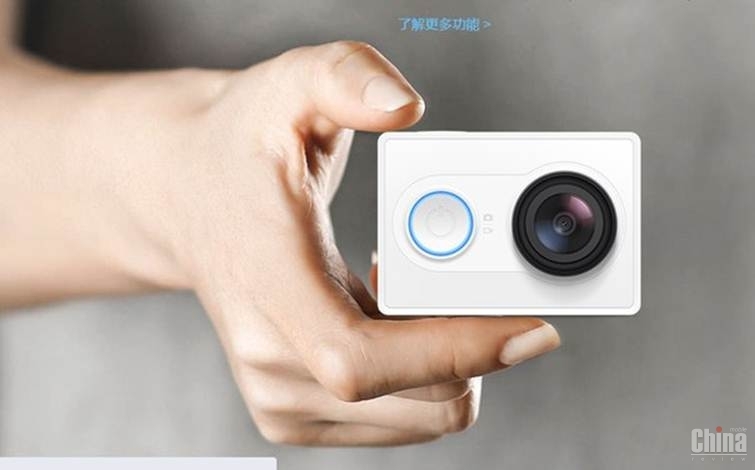 Yi Camera will accompany you on sea travels, while climbing a high mountain and record coasting from snowy mountains. By tracking the speed, the camera will instantly record every moment of your cat jump. During the trip, delayed fotoshoot will help you to fixate any quick movement. Each photo will be endowed with a special effect. Do not be afraid of lens, and that photo will be unnatural and inanimate! There are wide range of accessories, specially for Yi Camera, to help you to securely install it on any surface, such as helmet, bike or monopod ... and even your pet! Forget about what you need to shoot, dive into your emotions and get delightful pictures at the same time. The combination of camera with every accessory helps for your new ideas, your creativity. It does not matter, whether you set the camera on a car and will record your journey, or install it on pilotless aircraft to shot open spaces in the sky, new and original images are guaranteed. In the near future new accessories will be presented, so stay tuned. For outdoor enthusiasts, the camera is equipped with a special video processor from a leading manufacturer - Ambarella A7LS GPU. Revolutionary image processing technology combined with high-speed shooting, with dynamic gain range and noise reduction provide images with incredible color palette. The only camera-owner of a video compression standard H.264, even at the lowest data rate transfer provides Full HD video quality and allows you to store more videos on your memory card. 16-megapixel Sony Exmor R CMOS-high-sensitivity matrix provides an exceptional level of images detalization with minimal noise. Even in a cloudy weather, at night or in other low-light conditions, you get an image of excellent quality. Common camera does not allow you to quickly share vivid photos with your friend. Now, thanks to the mobile application Yi Camera, you can do not only take pictures in real time, but also quickly send pictures and videos on your phone with a built-in WIFI adapter. In addition, thanks to the editor, you can use the filter settings, chose soundtrack, or create hilarious short videos, while many options for social networks will support sharing your photos and videos with friends and getting their likes. In order for an elegant camera to have unmatched specs, we needed to re-design an each component part. The body is made of ABS-polycarbonate, impact-resistant, thermoplastic, technical and durable material. Now you do not have to think about security of camera in extreme conditions, enjoy from relaxation and fun of shooting.